winemakers in Spain could soon find themselves scrambling for juicy red grapes. People may also find olives and cheese missing from their salad plates. The olive and grape farms that thrived in the balmy Mediterranean could become relics of the past with countries like Spain facing the prospect of desertification. Almost 35 per cent of the country is at risk. So far, desertification is known to have threatened 20 per cent of the world's population, mostly from dry and arid countries, forcing poor people to migrate. But now it has started taking a toll on rich people's diet. The reason for this complacence was the belief that deserts are formed due to climatic variations such as decreasing rainfall and increasing soil erosion. But several other factors also contribute to it. A new study linked it to socioeconomic activities such as overgrazing and policies promoting livestock production. This explains why savannah-like grasslands in Spain, with a relatively balanced ecology, are turning into deserts. The study suggested that socio-economic factors such as overgrazing, growing water demand for agriculture, unsustainable pattern of consumption, government policies promoting profit-driven farming and infrastructure expansion are the indicators of desertification. Using these indicators, the scientists from Universidad Politcnica de Madrid, Spain, developed a set of eight mathematical equations and proposed a computer model. The model simulates different syndromes of desertification -- such as reduced soil productivity, increased soil erosion and depleted water table -- and helps predict future deserts. Previously these syndromes have been used as indicators of desertification. "Conventional indicators provide information about the ongoing desertification process," said Javier Ibanez, the lead author. The model supplements the information offered by conventional indicators and goes a step beyond. It predicts the risks ahead, Ibanez said in the journal Ecological Modelling (Vol 213, No 2). Using the computer model, the scientists studied three ecologies in Spain: rainfed region, areas under intensive irrigation and commercial rangelands. 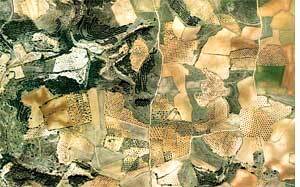 In Spain, crops like olives and grapes are planted on slopes under rainfed conditions. Frequent removal of weeds makes the soil vulnerable to erosion. The simulation found policies promoting expansion of such crops would cause further erosion. In areas where farmers practise water-intensive agriculture, overexploitation of groundwater would result in high soil salinity, reduction in river flow and loss of wetlands. Similarly, in commercial rangelands, policies encouraging livestock production would lead to over grazing and exacerbate soil erosion, the model suggested. Estimates show that desertification has led to the loss of six million hectares of farmland (about the size of Himachal Pradesh) every year since 1990. This can be remedied or reversed through land management, but the process is expensive. "Traditional measures call for significant labour force, which is unprofitable for farmers," said Ibanez. Hence, it is important that policy makers know the early symptoms of land degradation and manage it, he said. The team is currently using the model to understand impact of livestock grazing in Senegal. Scientists in India also find the indicators relevant. "This explains the gradual degradation of rainfed areas in Gujarat and Rajasthan," said D K Painuli, principal scientist at Jodhpur-based Central Arid Zone Research Institute. "Overexploitation of groundwater, low rainfall and overgrazing are already leading to desert-like conditions here; intensive-irrigated areas in Punjab are facing salinity, another syndrome of desertification," said Painuli. The study is not the only one to blame socio-economic factors for expanding desertification. A study published in the journal BioScience in 2004 concluded that desertification is driven by technological innovations such as water pumps, boreholes and dams. It said any policy intervention encouraging agriculture expansion will bring in more areas under the risk.